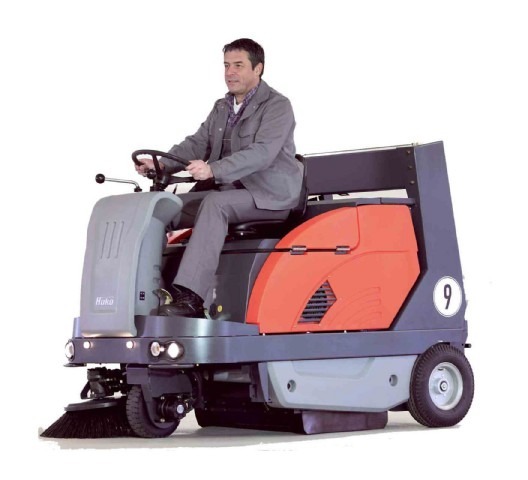 The Hako-Jonas 1200 allows you to select between petrol/LPG, diesel or battery power. As a result, all kinds of indoor and outdoor duties are possible. The petrol and diesel versions have powerful and consequently quieter 2-cylinder motors – the diesel version is watercooled. But the Hako-Jonas 1200 gives you more than just better performance. The aim of our designers was to ensure that even long shifts do not result in fatigue. An ergonomically optimized driving position gives users of widely differing builds a comfortable seat and a perfect view of the working surface. The large wheels can even mount kerbs effortlessly and ensure increased driver comfort on uneven surfaces. The generously-dimensioned coarse dirt flap, operated from the driver’s seat, allows even large items such as stones or pieces of wood to be picked up. And then when everything ends up in the 130 litre dirt container, a discharge height of 145 cm makes sweeping easy to empty into larger containers. The container capacity can be used to the full capacity because the lifting power of the high discharge system is generous at 220 kg. And that means: quality made by Hako. Hako customers remain Hako customers because Hako consciously invests in long-life machines. For example, the solid steel frame and other painted steel parts of the Hako-Jonas 1200 are given 2 coats of extremely durable corrosion protection and thus meet the most stringent quality assurance requirements. This has been proven in 1200 hours of salt spray mist testing. Durability – a new standard. The features of the Hako-Jonas 1200 cater for every requirement. Depending on your conditions of use, select from options including driver roof, second side broom on the left-hand side, rpm control for side brooms, flashing light, lighting to comply with highway regulations or a silencing package.